In a discussion a little while ago on What’s the Palaver? – Kiehl and Trenberth 1997, one of our commenters asked about the surface forcing and how it could possibly lead to anything like the IPCC-projected temperature change for doubling of CO2. ..We first look at the RHS. We believe that the atmosphere will also increase in temperature by roughly the same amount, so there will be no change in the conductive term. The increase in the Radiative term is roughly 5.5W/m². The increase in the evaporative term is much more difficult, but is believed to be in the range 2-7%/DegC. So the increase in the evaporative term is 1.5 to 5.5W/m², for a total change on the RHS of 7 to 11 W/m². Since balance is an assumption, the LHS changed by the same amount. The surface sensitivity is therefore 0.095 to 0.15 DegC/W/m². Note that this is the sensitivity to changes in Surface Forcing, whatever the source. It is NOT the response to Radiative Forcing – there is no response of the surface to Radiative Forcing, it can only respond to Sunlight and Back-Radiation. [See the whole comment and exchange for the complete picture]. These are good questions and no doubt many people have similar ones. The definition of radiative forcing (see CO2 – An Insignificant Trace Gas? Part Seven – The Boring Numbers) is at the tropopause, which is the top of the troposphere (around 12km above the surface). 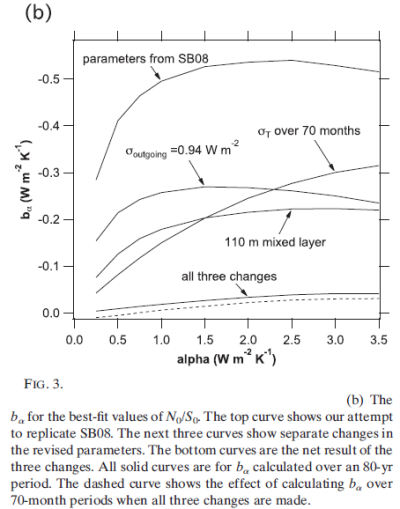 ..Manabe & Wetherald’s  paper, which convincingly demonstrated that the CO2-induced surface warming is not solely determined by the energy balance at the surface but by the energy balance of the coupled surface-troposphere-stratosphere system. 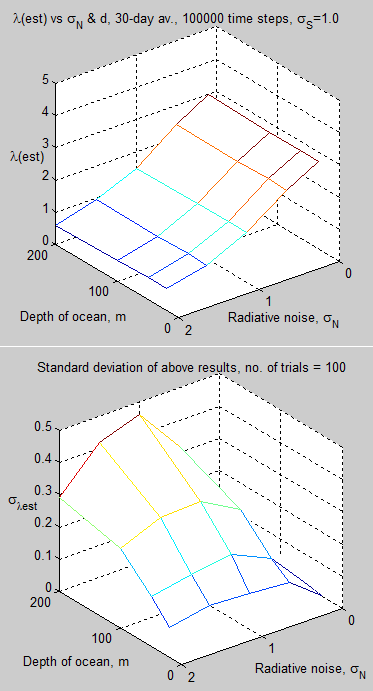 The underlying concept of the Manabe-Wetherald model is that the surface and the troposphere are so strongly coupled by convective heat and moisture transport that the relevant forcing governing surface warming is the net radiative perturbation at the tropopause, simply known as radiative forcing. In essence, the reason we consider the value at the tropopause is that it is the best value to tell us what will happen at the surface. It is now an idea established for over 40 years, although for some it might sound bizarre. So we will try and make sense of it here. The first thing to pay attention to is the right hand side – 1. CO2 direct surface heating – which is shown as 1.2 W/m². 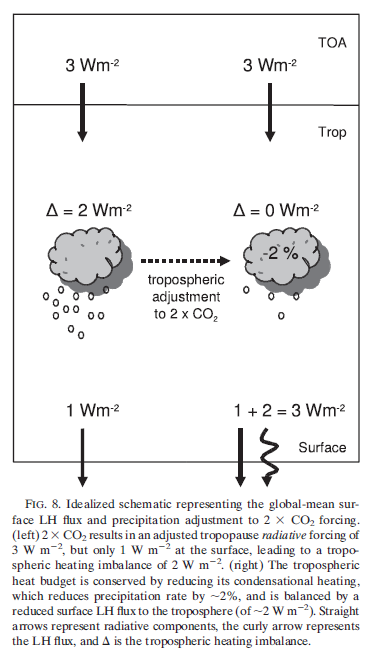 The surface forcing from a doubling of CO2 is around 1 W/m² compared with around 4 W/m² at the tropopause. The surface forcing is a lot less than at the top of atmosphere! Before too much joy sets in, let’s consider what these concepts represent. They are essentially idealized quantities, derived from considering the instantaneous change in concentrations of CO2. As CO2 shows a steady increase year on year, the idea of doubling overnight is clearly not in accord with reality. However, it is a useful comparison point and helps to get many ideas straight. If instead we said, “CO2 increasing by 1% per year”, we would need to define a time period for this 1% annual increase, plus how long after the end before a new balance was restored. It wouldn’t make solving the problem any easier – and it would make the results harder to understand – by contrast GCM’s do consider a steadily rising CO2 level according to whatever scenario they are considering. So, with the idea of an instantaneous doubling, if the surface increase in radiative forcing is less than the tropopause increase in radiative forcing, this must mean that the balance of energy is absorbed within the atmosphere. 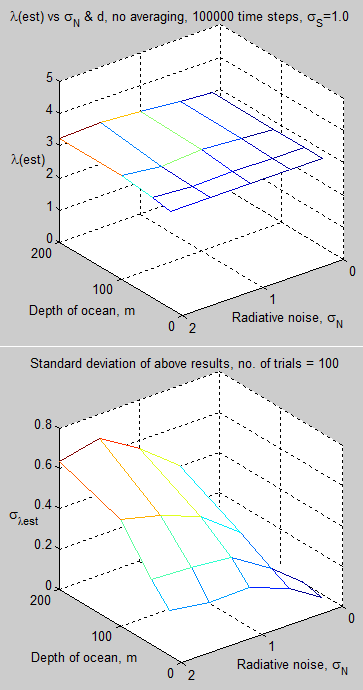 And also, we have to consider what happens as a result of the surface energy imbalance. 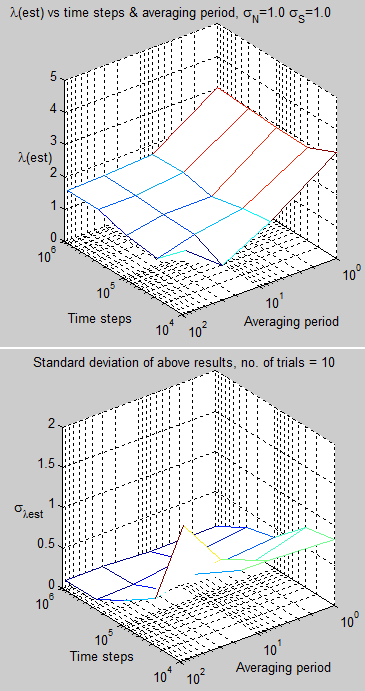 The numbers I use here are Ramanathan’s numbers from his 1981 paper. Later, and more accurate, numbers have been calculated but don’t affect the main points of this analysis. The reason for reviewing his analysis is because some (but not all) of the inherent responses of the climate system are explicitly calculated – making it easier to understand than the output of GCM. The immediate result of this doubling of CO2 is a reduced emission of radiation (OLR = outgoing longwave radiation) from the climate system into space. 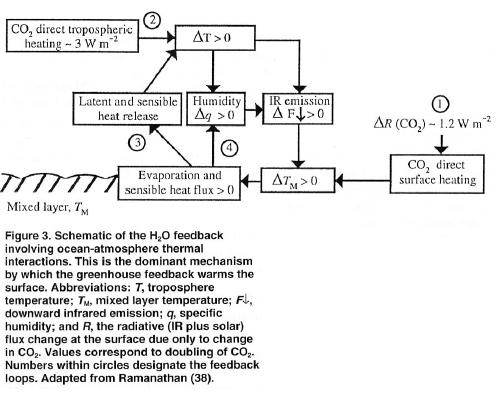 See the Atmospheric Radiation and the “Greenhouse” Effect series for detailed explanations of why. At the tropopause the OLR reduces by 3.1 W/m², and downward emission from the stratosphere into the troposphere increases by 1.2 W/m². The stratosphere cools and reaches a new radiative equilibrium. This reduces the downward emission from the stratosphere by a small amount. The new value of radiative forcing at the tropopause = 4.2 W/m². The surface-troposphere warms until a new equilibrium is reached – the radiative forcing at the tropopause has returned to zero. So let’s now consider the surface. 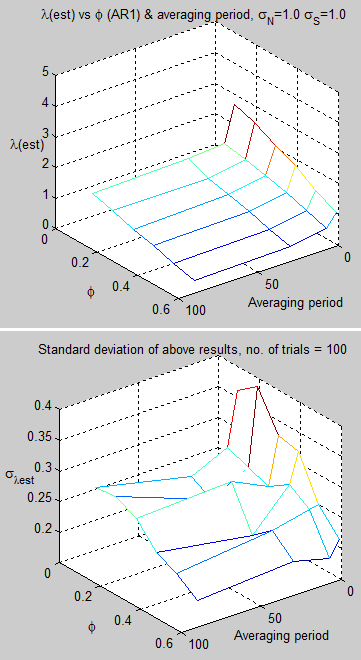 Take a look at Figure 1 again. 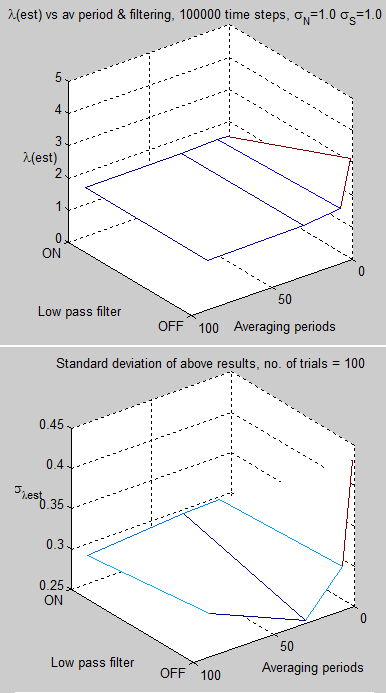 The values/ranges we will consider are calculated by a model. This doesn’t mean they are correct. It means that applying well-understood processes in a simplistic way gives us a “first order” result. The reason for assessing this kind of approach is because our mental models are usually less accurate than a calculated result which draws on well-understood physics. As a caveat, the system we considered up to this point to elucidate the principles of warming is a highly simplified linear system. 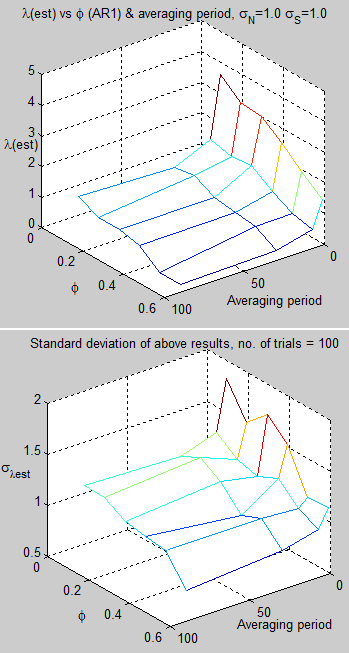 Its use is primarily educational and cannot be used to predict actual changes. Process 1 is as already described – the surface forcing increases by just over 1 W/m². But the balance of 3 W/m² goes into heating the troposphere. Process 2 – The warming of the troposphere results in increases downward radiation to the surface (because the hotter the body, the higher the radiation emitted). The calculated value is an additional 2.3 W/m², so the surface imbalance is now 3.5 W/m² and the surface temperature must increase in response. Upwards surface radiation and/or sensible and latent heat will increase to balance. Process 3 – The surface emission of radiation increases at around 5.5 W/m² for every 1°C of surface temperature increase. But this is almost balanced by increased downward radiation from the atmosphere (“back radiation”). The net effect is only about 10% of the change in upward radiation. So latent heat and sensible heat increase to restore the energy balance, but this also heats the troposphere. 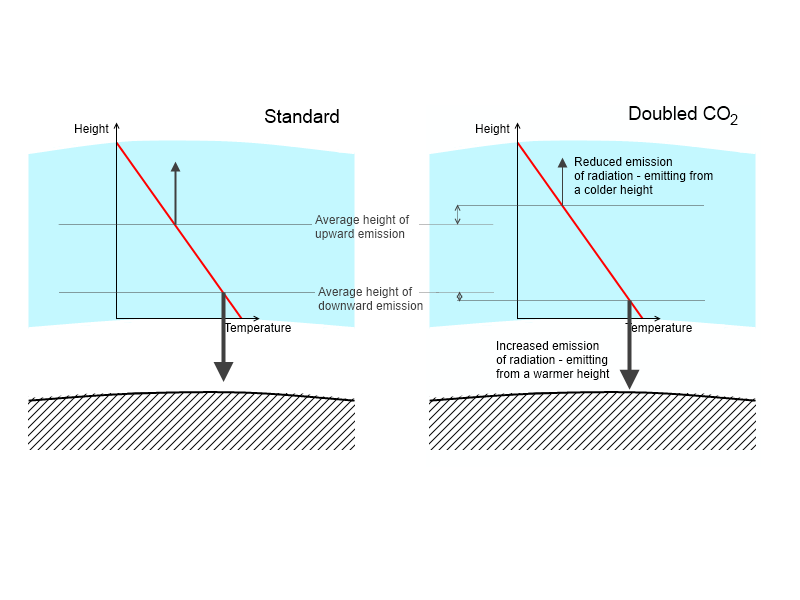 Process 4 – The tropospheric humidity increases. This increases the emissivity of the atmosphere near the surface, which increases the back radiation. 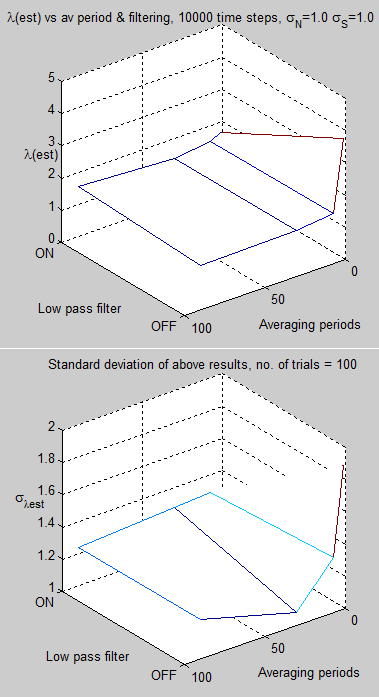 So essentially some cycles are reinforcing each other (=positive feedback). The question is about the value of the new equilibrium point. In Ramanathan’s 1981 paper he gives some basic calculations before turning to GCM results. The basic calculations are quite interesting because one of the purposes of the paper was to explain why some model results of the day produced very small equilibrium temperature changes. Sadly for some readers, a little maths is necessary to reproduce the result. It is simple maths because it is based on simple concepts – as already presented. As much as possible I follow the equation numbers and notations from Ramanathan’s 1981 paper. → LH + SH + F↑ = F↓ + S + ΔR …. And see note 1. We have simple formulas for the left hand side. Where ρ = density of air = 1.3 kg/m, L = latent heat of water vapor = 2.5 x 106, CD = empirically determined coefficient ≈ 1.3 x10-3, V = average wind speed at some reference height above the surface ≈ 5 m/s, q*M = specific humidity at saturation at the surface temperature of the ocean, qS = specific humidity at the reference height, TM = temperature of the ocean at the surface, TS = temperature of the air at the reference height (typically 10m). To give an idea of typical values, for every 1°C difference between the surface and the air at the reference height, SH = 8.5 W/m²K, and with a relative humidity of 80% at the reference height (and 100% at the ocean surface), LH = 55 W/m²K. TM‘ = ΔR(0) + ΔF↓(2) + ΔF↓(3) …. 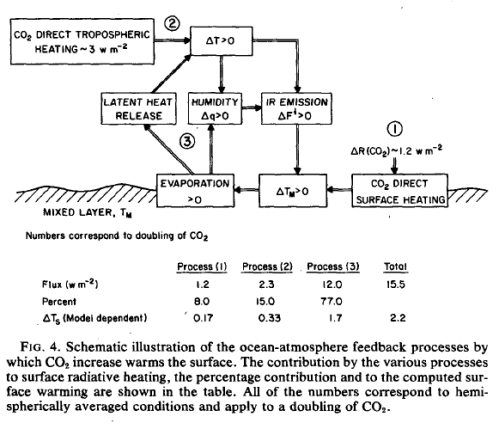 As an interesting comparison, Ramanathan reviewed the methods and results of Newell & Dopplick (1979) who found a changed surface temperature, Tm’ = 0.04 °C as a result of CO2 doubling. Effectively, very little change in surface temperature as a result of doubling of CO2. Ramanathan states that the calculations of Newell & Dopplick had ignored the red terms and the green terms. Ignoring the red terms means that the heating of the atmosphere is ignored. Ignoring the green terms means that the effect of the ocean surface heating is inflated – if the ocean surface heats and the atmosphere just above somehow stayed the same then the heat transferred would be higher than if the atmospheric temperature also increased as a result. (Because heat transfer depends on temperature difference). I expect that many people doing their own estimates will be working from similar assumptions. The paper itself is well worth reading and perhaps will be the subject of another article at a later date. I haven’t demonstrated that the surface will warm by 3°C for a doubling of CO2. But I hope I have demonstrated the complexity of the processes involved and why a simplistic calculation of how the surface responds immediately to the surface forcing is not the complete answer. It is nowhere near the complete answer. The surface temperature change as a result of doubling of CO2 is, of course, a massively important question to answer. GCM’s are necessarily involved despite their limitations. 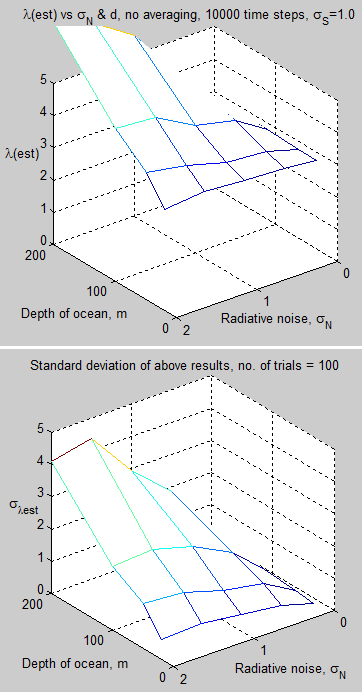 w = <w> + w’, where <w> = mean vertical velocity and w’ = deviation of vertical velocity from the mean, likewise T = <T> + T’. 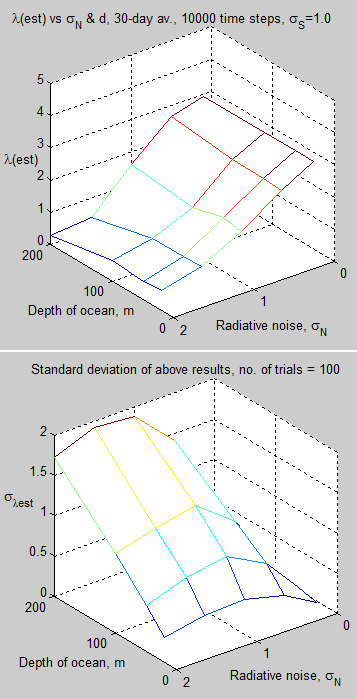 By various thermodynamic arguments, and especially by lots of empirical measurements, an estimate of heat transfer can be made via the bulk aerodynamic formulas shown above, which use the average horizontal wind speed at the surface in conjunction with the coefficients of heat transfer, which are related to the friction term for the wind at the ocean surface. Note 3: The calculation of each of the partial derivative terms is not shown in the paper, these are my calculations. I believe that ∂LH/∂TS = 0, most of the time – this is because if the atmosphere at the reference height is not saturated then an increase in the atmospheric temperature, TS, does not change the moisture flux, and therefore, does not change the latent heat. I might be wrong about this, and clearly some of the time this assumption I have made is not valid.